"In January 1947, the Air Ministry issued the specification F.44/46 for a two-seat, twin-jet-engine, night / all-weather fighter to replace the de Havilland Mosquito. A number of companies responded to the request, but none of their proposals met the requirement. The Meteor night fighters remained in front-line RAF service until 1961. The total number of Meteor night-fighters built by Armstrong-Whitworth was 547. " Doing a preview once the kit has already been featured in a build article isn't the easiest thing to do, but I think it is important that one get the opportunity to see just what comes in the box. It provides some perspective on the amount of effort that the builder had to put into the finished product. 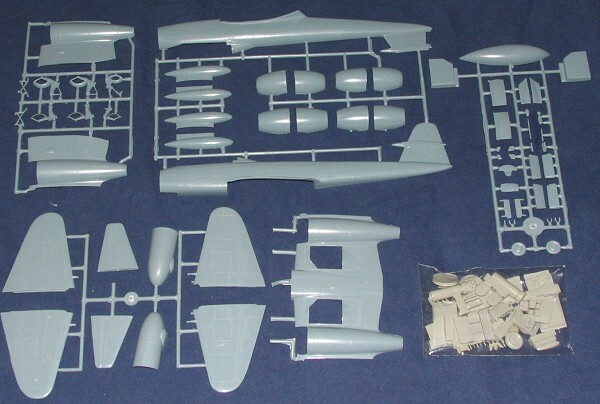 Classic Airframes has always strived to provide the builder with a kit that can be built properly right out of the box without the need to resort to aftermarket bits to give the additional detail that some modelers like to add to their work. The plastic is a bit thicker than the norm, but not at all unusual for a short run kit. Detail is nicely engraved and this kit provides a rather hefty bag of resin for a lot of the detail parts. For the record, the resin consists of ALL the bits needed for the cockpits as well as some nese gear bits and the wheels. There are also some scoops and other smaller bits in resin, but the majority of the parts go in the cockpits. You'll also need 60 grams of weight (that is 2 ounces) as the Meteor is a major tail sitter. Fortunately, you have that nice, big rad ome to properly stuff with weight. There are options of a sort. One is the choice of larger or smaller intakes. Actually, the big intakes were a requirement for the NF.13, but it wasn't unusual for the NF.11 to have them. There is a centerline belly tank and wing tanks. Since these early turbojets were thirsty suckers, it was not uncommon for all three to be carried. There are also a few antennas that will depend on the references you use as to whether they were carried or not. Instructions are very good with well drawn construction sequences. They include a number of additional diagrams to be sure you get things properly aligned. As with all kits of this type, lots of dry fitting is recommended, as trouble early will only make things worse a bit later in the build. Markings are provided for three aircraft. One is the box art NF.13 of the Egyptian Air Force in 1955. Then there is a 5 Sq RAF NF.11, and a 39 Sq NF.13, properly adorned with Suez Stripes. 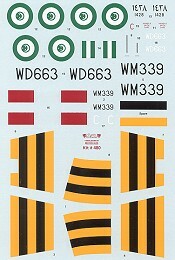 The kit decals are superbly printed by Microscale so are of the highest quality available. Not shown is an additional sheet with stencils and RAF roundels. As you note in the intro, several other countries flew these versions, and I do believe that Xtradecal provides a sheet with several options on it, though I've not seen it. 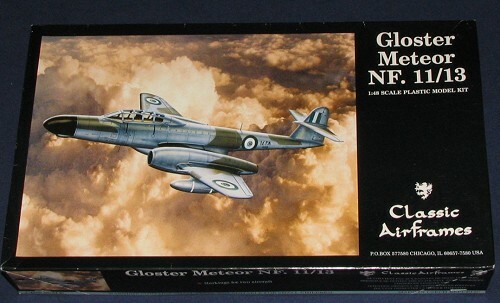 This will be the final kit in Classic Airframe's Meteor family, so there will be no NF.12/14. Still, it is a very nice kit of an important aircraft with the RAF. It isn't a snap to build as the various articles in MM will attest, but you are given all the parts needed and you only need to apply skill to have a super representation of what was probably the RAF's last purpose-built night fighter.